Great wedges. Looks great, perform as you'd expect, tons of green-side spin. 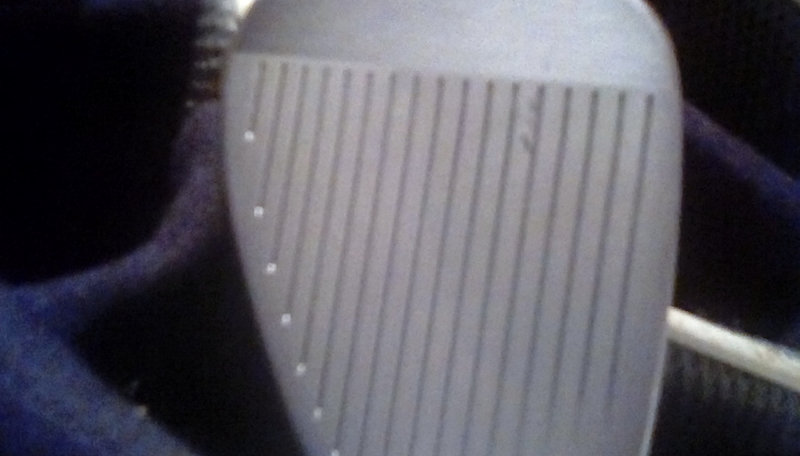 When this wedge was brand new, I was able to backup a Z-Star ball on 20 yard pitches. They're good. Only downside is I wish it were easier to customize shafts, but that's common with almost all club MFGs unless you order direct from their website and pay a stiff premium. I purchased a 50 and a 56 both with mid- bounce. Love the feel and especially how they grab the greens. I can throw shots more at pins knowing they will check up rather than roll out. Makes one feel like a pro. Bill M.
I’m just the average golfer but with these wedges I am actually learning to play wedges the way they are intended to be used. I purchased a 54 and 58 when these first came out, and I've enjoyed them ever since. Easy to hit and versatile. I play and practice often, so when I saw the opportunity to get some fresh ones at a great RBG price, I grabbed them! Great price, selection and service. Great addition and upgrade to go along with my recently purchased CBX iron set. I purchased the 56? with 8* Bounce and felt it smooth and easy. I would definitely recommend this! It's a very good wedge. I've been using a lot of wedges, It's the best. It has 3 beats for tolerance, comfortable address, and even spin. Easy to hit, very forgiving. I've been wanting to get a nice set of wedges to compliment my Epic and JPX 900 irons, so I was all ready to pull the trigger on the Callaway Mack Daddy 4's and I saw the RTX 3's that were left over and liked the way they looked and felt so I decided to A and B them head to head. While I can't say a single bad thing about the MD I was thoroughly impressed with the RTX. They were easy to control and the spin was every bit as good as the MD. Difference is Golf Galaxy sold me the RTX for $69 a piece. So if I couldn't feel a difference in the two why would I spend $80 each more? I didn't! And if they we're the same price it still would be a toe. The RTX 3's are amazing and I've gamed them 3 times now and hit them at the range about 6 times now. What a great wedge, I dare you to try these vs the MD and tell me you felt twice the difference if any at all. Great job Cleveland!! ProsNice sweet spot Let's you know if you are off and where Stick to the greens great When you hit it center, you know it! Last year's model for 50% off because the box was opened.... I will take it. Love my 50 degree! How’s well with my 46 and 58 degree CLEVELAND wedges! ProsConsistently good on every shot 105-115. ConsStock grip, but that?s a personal preference. I change out all my grips. Got the 52, 56, and 60, love these. huge upgrade for me after many year of using 15 year golf wedges. I borrowed one of these from a friend this past weekend. Absolutely loved it. I will most likely buy a couple for myself. Fantastic feel and weight, and the spin and control was great. My 52 degree wedge needed replacement, thus procured a Cleveland Golf RTX-3 Tour Satin Wedge *Open Box*. As advertised, like new and performance better than previous club. This is my fourth purchase from Rock Bottom Golf. Satisfied with price, expedient delivery and emails keeping me informed on delivery status. Keep up the GREAT professional attitude and business. Received package with tore up wrapper, only to find out it was a scratched on the face. Probably on transit but nevertheless i always read to make sure i know what im buying from this site. If its like new, excellent so on and so, being left handed its hard enough to find certain clubs as it is but dealing with you I've spent around 400$ since September and i know your a discount market, but its times like these that make me hesitate in the future. Great wedge great price . Still winter,but at this great price couldn’t pass up.Don’t think I got the right bounce for carpet but it feels good to swing. As usual with RBG, great price and quick delivery. Good looking club and can't wait to try out the cavity back design. Too cold now in the north to play outside but will go as soon as weather warms up enough to play. The best wedges you can get for the price. good spin and an overall great wedge. This wedge is amazing. It is great around the greens and the feel is amazing. The CB gives me that little extra confidence that is needed when I take full shots. I would definitely recommend this wedge to anyone. Cleveland is the best wedge on the market and for this price can’t beat it! Wanted a new set of wedges for next season, but wanted to save some money. Saw the Cleveland RTX-3 Open Box at a great price-$70 each. Ordered three wedges to upgrade from the RTX-2 wedges I've played the last two years and was very happy with my decision when I opened the package. All three wedges had the plastic on the heads and two of them still had the plastic on the grips. Brand new clubs for a great price. Can't wait for next season. Pros"New" wedges for $70 each. Great wedge set and a great price! Upgraded my three wedges 52, 56, 60 (588) to the RTX-3. Great clubs at a great price. Definitely glad I made the switch. Pretty hard to make a wedge difficult to play. Cleveland always nails it. This wedge greatly improved my short game. what a game changer for me. This club is versatile and puts a ton of spin on the ball. I just replace a Vokey with this and couldn’t be happier! This wedge greatly improved my short game. It is easy to hit, great loft, and creates spin I couldn't get on my old wedge. Even on mishits, ball goes to target. I really like the way this club feels and looks. It has a heavier weight than my previous wedges. Just have to dial in my distances. I have never been a good bunker player but now I have the confidence to get out in one shot. Thank you Cleveland and thank you Rockbottom for a fantastic price! Replaced my old RTX and what a difference! The spins and stops within inches of the pitch mark. Always been a fan of Cleveland wedges, but RTX-3 CB is one of their best. Very forgiving with excellent spin. Look great at address, great weight and feel, impact is amazing feels like your not even hitting a ball. Outstanding grooves for amazing shot control. ProsThese wedges allow you to brag to your buddies and be able to back it up. This was a great buy. Price was awesome and the club is perfect for tight lies around the green. Highly recommend this wedge if you struggle with short, high shots around the green. These wedges are the best I have ever owned. Their new soles are terrific and make chipping a pleasure. As always another great deal from Rockbottom! I loved the brass look on the head of this club and the looks aren't everything. Great feel when you connect with the ball. Overall good control for all types of shots. I've always had Cleveland wedges.Never had graphite shafts on wedges even though my irons have been graphite for years. I really do like the wedges with graphite shafts. Thanks Cleveland.